From the June 2009 E-Block. The Ticker will return on Wednesday after the holiday. In past E-Block editions, we had a series titled The Ghosts of End Times Past, in which we profiled eschatological commentators whose names were most famous in earlier years. Our focus now moves to what we will call the Ghosts of End Present - prophecy teachers whose names are currently famous and who are making a mark on the Christian scene. We begin with someone whose name has appeared on a list of the 50 Most Influential Christians today: John Hagee, author of many books, pastor of the Cornerstone Church in San Antonio, and prominent television preacher. Hagee's ministry is quite influential, to the point that he might be referred to as "Joyce Meyer doing the End Times." I knew little of Hagee prior to my research for this article, save that his advocation of traditional dispensational eschatology involved a strident defense of the modern political state of Israel. We will not here decide the virtues of that support from a political perspective, although we will have cause to address Hagee's rationale for that support as it forms a considerable foundation for his eschatological outlook. We will also not concern ourselves with Hagee's other theological stances; only with his eschatology. Financial Armageddon (Front Line, 2008) [FA] Except for IDI, these books contain material on the subject of eschatology. BFJ partially and IDI specifically discuss Hagee's support for modern Israel. We'll divide this article into two portions, one for each topic. Part of our investigation in this series is to discover any new or unusual teachings on dispensational eschatology, to see what might be offered as the best possible arguments. Hagee, it is fair to say, provided little or nothing new that I have not already seen from teachers in the Ghosts of End Times Past series, particularly Hal Lindsey. Indeed, the resemblance to Lindsey is to the point that it is disturbing: Not only is the scriptural exegesis a mirror for Lindsey (though I attribute that to a common core of teachings and exegeses, not direct copying from Lindsey to Hagee), but so are the techniques. BE, 120: Hagee validates his exegesis of Matthew 24:27 by appealing to an unnamed library book on meteorology he pulled off the shelf as a grad student. To validate his future view of the Antichrist's "mark of the beast" system, he appeals to a story of an unnamed scientist who brought him a box marked "Top Secret" that was filled with computer chips, supposed to be good for implanting under the skin. More than once, Hagee appeals to visits in his office from unnamed persons as validation. Also more than once, Hagee misreports quotations and facts because he relies on questionable sources. At BE112, he refers to a quote reportedly by Augustine, saying that the early Christians "caught orators by fisherman - not fishermen by orators." This quote is used in service of a sort of anti-intellectual point, but it appears to be a misquote. There is a similar quote where Augustine says fisherman were chosen as disciples rather than orators or others for the sake of humility, but this does not serve the purpose for which Hagee wishes to enlist Augustine. While Hagee makes many excellent points against stereotyped views of Jesus and the apostles as blond, blue eyed white men, and does well indeed to point the finger at past Christian anti-semitism, he uses many questionable sources to back up his specific claims. At FDJ12, Hagee's source for information on the Inquisition is the Jewish philosopher Dagobert Runes - and that appears to have been his only source for many claims on the subject. As frequent readers know from my article here, there are far more qualified and reputable sources such as Henry Kamen that are available for consultation. As it is, at IDI26, Hagee claims that the Inquisition burned alive 323,362 people - which is 321,362 people more than Kamen, a professional historian, indicates were killed by Inquisition over its entire history of several hundred years. At IDI19-20, Hagee erroneously says that Constantine made Christianity "the official state religion," which is untrue: Constantine legalized Christianity, but paganism remained the official state religion until the time of Theodosius I, later in the century. Hagee also repeats odd sentiments that Constantine's Christianity was "full of idolatry because of pagan influence" and was essentially a "mother-child cult" - these are not claims made by responsible historians, and more closely resemble something that might be said by persons who argue that the story of Jesus was a copy of that of Mithra. Hagee also quotes a source as saying Constantine and the Nicean council imposed edicts to persecute Jews; the quotes calls Jews "parasites" and "murderers of our Lord." Hagee's source is Gil Kaplan's, Israel's History of Persecution - a book so obscure that it is not even in OCLC. The quote, in any event, is much mangled; it may be found here, and it refers to "parricides," not parasites, and also does not contain a good chunk of what Kaplan reports. Admittedly, it is still not very complimentary to Jews, but it also not as radically insulting as Kaplan (and thereafter Hagee) make it out to be in their version of it. These may seem minor issues, but for one such as myself who does research by trade, Hagee's uncritical use of sources is quite difficult to countenance, and make it hard to trust Hagee as a reliable source of information. Never Mind What I Said. Far more disturbing, however, than Hagee's carelessness with sources is the way he approaches exegesis of the Biblical text with reference to modern times as an interpretative template. Like Lindsey, Hagee did his best to interpret current events in light of a dispensational paradigm. This is natural, and not to be begrudged, but it is not the disturbing part. Rather, it is that, like Lindsey, we see no sign as we advance thorough Hagee's work chronologically that he admits that his earlier prognostications were in error. To explain this, let's advance chronologically through Hagee's books that we examined. Like Lindsey, Hagee reaches into current "fads of disaster", such as the ebola virus (88), to interpret Biblical prophecy. But in this book in particular, it was the 1996 assassination of Yitzhak Rabin that is said to have "launched Bible prophecy onto the fast track" (8) because" His blood will now become the bonding force that will drive the nation of Israel and other leaders of the Middle East to new heights of unity to secure a legacy of peace" in Rabin's memory. Hagee also predicts that oil will be the main motive for a Russian invasion of Israel, as they attack Israel to appease Islamic nations, who will cede control of some oil in return for the favor. 37-8: Noting that NATO has 16 members, the Council of Europe 33 members, and the European Union 16 members (as of that date), Hagee explains the fulfillment of the "ten nations" prophecy by suggesting that "any of these groups could consolidate to ten." Arguably, so could the 50 states of America or the 67 counties of my home state of Florida, but that's not a very good reason to see any of those as Daniel's ten horns in the early stages. Hagee is explaining away, not explaining, why these organizations do not fit the dispensational format. 98: Seeking to validate the dispensational view with reference to the "earthquakes as birth pains" prophecy of Matthew 24, Hagee notes that the number of quakes recorded has increased. In an endnote [193-4] he concedes that this number has increased because of better detection abilities, and acknowledges the Geological Survey's findings that earthquake numbers have "stayed relatively constant." However, Hagee concludes: "Nevertheless, it is true that the Bible predicts that earthquakes will increase in the last days, and the number of earthquakes measured has increased 1.58 times between 1983 and 1992." But haven't even more seismographic stations been installed during that 9 year period? Isn't Hagee essentially saying, "I know there's a reason for the increase that does not cohere with the Biblical interpretation I have offered, but they have increased anyway"? One oddity worth note at 134, as Hagee says: "You might say that 666 was stamped upon the very image of Nebuchadnezzar since the image was 60 cubits high and 6 cubits wide." I am no mathematician, but I am still trying to grasp the math on that one! Although this book predicts a severe "economic earthquake"  and again appeals to diseases like Ebola  as a sign of the End Times, one the main interpretive templates for future tribulational disaster is - as the date may suggest - the Y2K bug [52ff]. Hagee issues dire warnings of imminent economic chaos, deaths, and so on, thanks to the Y2K bug's effect on computers. Lindsey is simply too adept at sticking his moistened finger into the air to detect any sort of event or prediction that MIGHT support his exegesis. Things like Israel's mineral wealth, the Jupiter Effect, the HAARP project, and global warming (as well as the rejection of it!) have been recruited for Lindsey's purposes. This does not mean that all of these things are or will necessarily be bogus, but it does show that Lindsey is too ready to uncritically accept claims that he thinks he can use. He is also not particularly good at admitting when his use of these things was in error. It would have been nice if, in books like AC, he had admitted that "the Jupiter Effect" turned out to be a red herring. But while he's on the spot to show when he is right or looking right, he is far too reticent when it comes to admitting when he was not. In this respect, I am sorry to say, Hagee is not much different than Lindsey. 23: Daniel's statue's ten toes of iron and clay are read as a coalition of autocracies and democracies. This should be kept in mind for later. 107: Hagee addresses several views on the Rapture. Although works by Sproul and DeMar were already available, the preterist option is not one addressed by Hagee. 130: Hagee offers a fictional scenario with Saddam Hussein still in charge of Iraq, and joining forces with Russia to invade Israel. 228-9: Hagee finds some significance in that the colors of the demonic breastplates in Rev. 9:17 are, apparently, the same color as Eurodollar, except that red is missing. To resolve that difficulty, Hagee suggests: "Perhaps the Antichrist will add his signature color, red, to the mix, and the horsemen of Revelation 9 will wear the official colors of his new world government." Again, it appears that Hagee is too eager to detect fulfillments in whatever he can find. There is nothing about the Y2K bug as a cause for End Times events. Nor is there any admission of error by Hagee for his prior appeal to the Y2K bug. In light of this, I cannot but be disappointed in both Hagee and Thomas Nelson publishers. It is quite all right to have been mistaken about things like the Y2K bug (as indeed many were), but it is not acceptable to be mistaken about it in such an important way, and then not own up to one's earlier mistake -- especially with respect to books that sells hundreds of thousands of copies, and are written by someone as prominent as Hagee. One other point of note concerns earthquakes (112-3). Since the data does not support the conclusion of an actual increase in the number or severity of quakes, Hagee re-interprets the prophect thusly: "...I believe He meant it would quake as it did in the past when God moved in the affairs of men." The quakes have thus gone from being literal to figurative. Note that the issue is not that Hagee has adopted one view or the other, but rather, that he does so, without any admission that his views have changed or that he erred in his earlier view. By now, it will be easy to guess where Hagee ends up in this newest book: The current financial crisis is the new sign of the End Times upon us, where before Rabin's assassination and the Y2K bug were not. The publisher, Strang, admits to having rushed this book through production in a mere 6 weeks (vii) - one is tempted to guess, because of the great possibility that the economic situation would change so quickly that the book would become dated. In light of the crisis, it is argued that people will look for global leader to solve financial problems (viii), and no doubt, this will be the Antichrist. Haggai 1:6 You have sown much, but harvest little; you eat, but there is not enough to be satisfied; you drink, but there is not enough to become drunk; you put on clothing, but no one is warm enough; and he who earns, earns wages to put into a purse with holes. Of this it is said, it "describes a future economic crash with runaway inflation." James 5:1-5 Come now, you rich, weep and howl for your miseries which are coming upon you. Your riches have rotted and your garments have become moth-eaten. Your gold and your silver have rusted; and their rust will be a witness against you and will consume your flesh like fire. It is in the last days that you have stored up your treasure! Behold, the pay of the laborers who mowed your fields, and which has been withheld by you, cries out against you; and the outcry of those who did the harvesting has reached the ears of the Lord of Sabaoth. You have lived luxuriously on the earth and led a life of wanton pleasure; you have fattened your hearts in a day of slaughter. And this, it is said, forecasts an "economic crash that will happen in the last days." I think it is clear that the exegesis of these passages owes much more to imagination than to sound, contextual principles of hermeneutics. 32: Dead Sea mineral deposits are offered as a reason for Russia to invade Israel. These deposits, we might note, were appealed to by Lindsey in the 1970s as a reason for Russia to invade. It has been 35-40 years, and these mineral deposits are still the subject of prophecy analysis -- and still remain unexploited? 57: Daniel's ten toes are now said to be a coalition of democracy and radical Islamic nations representing "ten governments" in the end times. Hagee has altered his stance once again, and without a concession of his prior interpretation. 66: The growth of Islam is appealed to as a sign of the End Times. There is no mention of the corollary and more significant growth of Christianity (as noted by Jenkins, per our review of The Next Christendom in the last issue of the E-Block). Such are matters of concern where Hagee's eschatological exegesis are concerned, and we now turn to something that is one of Hagee's, shall we say, "pet projects" -- support for the modern political nation of Israel. Again, we will not judge here the merits of such support, as that is beyond our scope. However, Hagee's motives for support deserve serious scrutiny. Replacement theology. Hagee has much unkind to say to those who argue that the Christian church has "replaced" Israel as God's covenant people. I will say by way of preface that I, myself, do not hold to a "replacement theology" and indeed would agree with Hagee that arguments for it are lacking. However, I do hold to a position which I will call expansion theology, one which as much displaces Hagee's view as it does replacement theology. In a nutshell, I do not think that Israel has been replaced, but rather, that the definition of "Israel" has been expanded (or perhaps "clarified" would be a better word) to mean "those loyal to God's covenant". My basis for this is Romans 9, which I exegete in detail here. Deuteronomy of course is a covenant, a treaty between a suzerain (Yahweh) and his subjects....disobedience to this covenant required punishment. 1. The "Prophet" like unto Moses is to be understood as Jesus, a mediator of a new covenant for all men. 2. The command given is to hearken unto this prophet. 3. It therefore stands to reason that disobedience of this command, to hearken unto this prophet, is a cause for punishment. Again, one may choose to dispute whether Jesus is indeed this prophet, but it is not arguable that if he was, and the Jewish adherents to the Deuteronimic covenant fail to hearken unto him, they are disobeying and breaking the covenant just as much as they would had they worshipped an idol, or murdered, or stolen. And thus, if they still today refuse to listen to his voice, they remain in rebellion to the commands of the Deuteronomic covenant and are subject to punishment. They have not been disowned, but they are still being punished. ...We say rather with Paul (Rom. 10-11) that the true Israel is not found in the flesh but in the heart. Israel has not been replaced but expanded, and those in rebellion as above are still subject to punishment. Hagee's objections to "replacement theology" are of no effect against this thesis. Let us ask this question: If Jesus had been recognized as the Messiah, in the way that he desired - if the Triumphal Entry had resulted in his being recognized as King of Israel, rather than rejection - how would things have been different? We would suggest that the Kingdom of God would have indeed begun on earth at that time (not just in the hearts of men): And hence, though knowing he would be rejected, Jesus prepared the way for his acceptance as Messiah during his ministry. The crucifixion, and the resurrection, were then in a sense a "Plan B" for the Kingdom of God, to use a rather crude term. We see even in Jesus' ministry, of course, hints that the "failure" of Plan A is imminent (viz. his predictions that he will be killed) - but Plan A is nevertheless put forward to the people as an option they can take if they are willing. They did not: Hence "Plan B" - and hence the most clear statement of its taking effect at the Last Supper, when betrayal and execution was imminent. And this is why Jesus speaks of the Kingdom of God coming in his teaching and healing ministry, whereas Paul saw it as evidenced by the Crucifixion and Resurrection. Note that in this I am not adopting a "neotheist" position whereby God did not know "Plan A" would fail -- I am saying that He left the door open with "Plan A" as a matter of justice and righteousness, though He knew we would reject it. I came up with this idea on my own, but apparently, it isn't new: Hagee refers to it as the "Crisis Theory." Hagee finds it necessary to object to this view and argue (as at FBJ 98) that the Jews did not actually reject Jesus, but rather, God prevented them from accepting Jesus so that Gentiles would be saved. One is constrained to wonder about the morality of a situation wherein God is said to prevent salvations in order to achieve others. However, we will deal with Hagee's objections to the "Crisis Theory" nevertheless. FBJ 100: Hagee rejects the Crisis Theory because "a sovereign and almighty God is not subject to the whims and choices of man." However, like Calvinism, Hagee's response neglects the dimension that in such a situation, God would have sovereignly surrendered the right of choice to men. It does not compromise God's sovereignty if God made the rules and ceded choice of His own accord. In IDI and FBJ, Hagee argues that "God's plan, from the beginning, was for Jesus to die" and he notes Jesus' predictions of his own death. This, however, is accounted for under the Crisis Theory (at least as I have formulated it) inasmuch as the offer of "Plan A" was made for the sake of justice and righteousness. God's foreknowledge that Plan A would be refused does not mean that it was not able to be accepted. Hagee appeals to the many places where Jesus says to "tell no man" of his deeds, and reads this as a way Jesus refused to be a triumphant messiah. In this claim, Hagee's errors are multi-fold. First, he ignores the fact that in spite of these admonitions, people went out and "told" anyway. Second, Hagee fails to reconcile these admonitions with quote obvious messianic acts by Jesus -- enterining Jerusalem on a donkey, the feeding of multitudes, and the public healing of Lazarus, for example. In this as well, Hagee fails to distinguish -- even as Jesus' contemporaries did -- between the political/military Messiah and a spiritual one. Jesus rejected the former, not the latter. Naturally, whether we take it to be an actual event of history or not, this explains the significance of the voice from heaven declaring Jesus' divinity after His baptism. Jesus would never, by the honor strictures of this day, be eligible to reveal himself as divine to a wider public audience; it would have to come first from an outside source: In order to make his salvific mission most successful, would have to work with, a constraint of history. Indeed, such open self-proclamation would have been seen as dishonorable, and taken as a strike against Jesus' divine identity. ...Jesus' reluctance to be known is an example of what would have been regarded as honorable behavior in the ancient world. For Jesus to have been plain about his divinity and Messianic nature in public would have aroused serious envy (as we do see it did, from his opponents, especially in John) as he would have been claiming a high level of honor, and this would have been seen as drawing from the well of honor, which was a "limited good". Thus to make such claims and take such actions would have been seen as taking honor from others. In an individualist society with limitless good, the thing to do is go out and share what you have with others, and even brag about it. The world Jesus lived in would have found such behavior intolerable; hence he twlls the leper to keep things quiet where his role is concerned. The "testimony" is for the purpose of the leper being able to return to normal society after being ritually unclean. Thus when Hagee argues [IDI 139] that if Jesus wanted to be Messiah, he "would have conducted himself like any other politician who would do anything the mind of man could imagine to make the nightly news" and "create public awareness" he is badly in error, and not in tune with the social strictures of the New Testament world. Behold, this child is set for the fall and rising again of many in Israel; and for a sign which shall be spoken against; (Yea, a sword shall pierce through thy own soul also,) that the thoughts of many hearts may be revealed. I can find nothing here to suggest that there was no "Plan A" in the offing; at most, indications (in the parenthtical portion) that might allude to Jesus' death -- but that would still not exclude a foreknowing of the rejection of "Plan A" as offered. Hagee's works fairly well take a dispensational exegesis for granted, and offer little in the way of defense of that exegesis. While one may applaud Hagee's stance against Christian anti-semitism, his building of a case for it includes some irresponsible elements. One does not correct error with more error in the opposite direction. Hagee shows no willingness to admit to his prior mistakes in prognostiation. Hagee's familiarity with broader Biblical scholarship, and the tools of research, is demonstrably lacking. I can close with no other words: It is unfortunate that one such as Hagee has gained as much influence as he has. But the church has much of itself to blame for allowing him to rise to prominence. 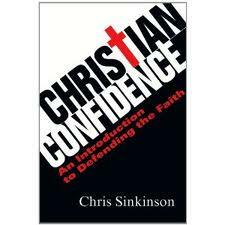 Book Snap: Chris Sinkinson's "Christian Confidence"
Chris Sinkinson's Christian Confidence (CC) is one of those unusual "introduction to apologetics" books that breaks the ice by actually discussing what apologetics is, and the philosophy behind it. It's also the most basic book of this type I have ever seen, which is not bad thing: We need to get people into apologetics early, and not even middle school is too early in an age when 13 year olds are getting horrible information off of Wikipedia and YouTube. As an apologetics introduction, CC also has chapters on a few critical topics: The Resurrection (naturally), archaeology (one of Sinkinson's special interests), NT reliability, and so on. It's somewhere between the level of McDowell and Strobel when it covers those topics. But the bones of apologetics is its main focus: CC has chapters on the history of apologetics, as well as its Biblical basis. Definitely give this one a shot if you have a middle or high schooler ready to break the ice. This is from the newest E-Block; as noted last time we posted one of these, I'm posting it now because of the short shelf life -- to say nothing of the urgency of putting Horn and Putnam in their place before they can deceive anyone else. For our next installment on Petrus Romanus (“PR”), we will have a look at some of the outlandish conspiracy theory claims the authors use as secondary evidence for the corruption of the Catholic Church (which, in turn, enables them to more freely errantly argue that Petrus Romanus is the expected "false prophet" of Revelation). PR appeals to the works of several authors who assert that various Satanic practices have been hidden by Catholicism. The first alluded to is Luigi Marinelli, an author of Gone with the Wind in the Vatican. The reliability of this source can be immediately questioned – as the obituary linked below notes, “no names were given, and most of the stories were decades old.” None of this means, of course, that the Vatican is free from scandal, but it also means that Marinelli is not a credible source to use for such outrageous charges made light of by the authors. Professional researchers, and practicing law professionals, would never use such tenuous material as evidence. The authors also appeal to Emmanuel Milingo, who reputedly, while at an “Our Lady of Fatima” conference, charged high ranking members of the church hierarchy with being in league with Satan. It becomes quickly apparent that Milingo is not exactly a credible witness. Milingo is famous for having taken part in a marriage ceremony under the auspices of Sun Myung Moon (link below). Any evangelical leader who pulled such a stunt would hardly be taken as a credible witness. His statement about Satan, moreover, was tied to unspecified accusations of sexual impropriety, not to any sort of conspiracy theory. Again, this is not to say that the Vatican is free of all such things, but that the use of someone like Milingo as a source is the wrong way to make a solid case. Their chief source of the sort, however, is Malachi Martin – a rather prolific writer in his time who also produced works of fiction. In one of those works, Windswept House, there is an account of a reputed "enthronement of the fallen Archangel Lucifer" in the Roman Catholic Citadel, on June 29, 1963, with an alleged parallel ceremony in Charleston, South Carolina, the site of an important Masonic Lodge. The authors make much of this, and you can find this story repeated on many conspiracy-theory websites. Yet why take this as history when it is in a fictional novel? Q. Your book begins with a vivid description of a sacrilegious "Black Mass" held in 1963 in Charleston, South Carolina. Did this really happen? A. Yes it did. And the participation by telephone of some high officials of the church in the Vatican is also a fact. The young female who was forced to be a part of this satanic ritual is very much alive and, happily, has been able to marry and lead a normal life. She supplied details about the event. Any prosecutor would find a conviction difficult based on such limited hearsay. Martin’s sole source is (reputedly) one woman who was said to be part of this event – and who apparently only concluded, based on a telephone conversation at the event, that Vatican officials were on the other end of the line. Various sources – many of them also of questionable worth – identify the woman pseudonymously as “Agnes” and say this event occurred in 1957, not 1963, and connect the event to Cardinal Joseph Bernardin (who was also accused of pedophilia by someone else later on, though those charges ended up dropped when the reputed victim, Stephen Cook, recanted – suffice to say there’s enough controversy there for another article entirely). At the time, the woman was supposed to be 11 years old, and supposedly reported these events to Martin in 1990. Given historic hysteria surrounding claims of Satanic ritualism, and the confusion of dates, these claims will require a lot more refinement and checking to deserve the status and importance that PR gives them. Among selected claims that follow are many offered in the service of a thesis that America was in some way founded as a Freemason’s occult paradise. We will check some of these in more detail in other contexts, but here, we will consider a claim – borrowed from their fellow conspiracy theorist Christian Pinto – that Benjamin Franklin was involved in occult sacrificial practices. The original Times article reported that the bones were “deeply buried, probably to hide them because grave robbing was illegal.” They said, “There could be more buried, and there probably are.” But the story doesn’t end there. Later reports from the Benjamin Franklin House reveal that not only were human remains found, but animal remains were discovered as well. This is where things get very interesting. From the published photographs, some of the bones appear to be blackened or charred, as if by fire… It is well documented that Satanists perform ritual killings of both humans and animals alike. To begin, I think it is wise to report what the whole of this Times article said, including important parts PR (or Pinto?) left out, with the most important bolded. WORKMEN have dug up the remains of ten bodies hidden beneath the former London home of Benjamin Franklin, the founding father of American independence. The remains of four adults and six children were discovered during the £1.9 million restoration of Franklin's home at 36 Craven Street, close to Trafalgar Square. Researchers believe that there could be more bodies buried beneath the basement kitchens. Initial estimates are that the bones are about 200 years old and were buried at the time Franklin was living in the house, which was his home from 1757 to 1762, and from 1764 to 1775. Most of the bones show signs of having been dissected, sawn or cut. One skull has been drilled with several holes. Paul Knapman, the Westminster Coroner, said yesterday: "I cannot totally discount the possibility of a crime. There is still a possibility that I may have to hold an inquest." The principal suspect in the mystery is William Hewson, who, like Franklin, was a Fellow of the Royal Society, and the husband of Polly Stevenson, the daughter of Franklin's landlady, Mary Stevenson. In the early 1770s Dr Hewson was in partnership with William Hunter, who, with his brother John, was one of the founders of British surgery. Dr Hunter and Dr Hewson ran a school of anatomy in Soho, but after an argument Dr Hewson left to live in Franklin's house, where he is believed to have established a rival school and lecture theatre. Dr Knapman added yesterday: "It is most likely that these are anatomical specimens that Dr Hewson disposed of in his own house, but we are still not certain about the bones' exact age or origin." Evangeline Hunter-Jones, deputy chairman of the Friends of Benjamin Franklin House, the charity concerned with restoring the property and opening it to the public, said: "The bones were quite deeply buried, probably to hide them because grave robbing was illegal. There could be more buried, and there probably are." Brian Owen Smith has volunteered to lead researches on behalf of the friends. He said yesterday: "The discovery represents an important insight into very exciting years of medical history. Benjamin Franklin, through his support for Polly and Dr Hewson, socially and scientifically, was very much part of that." To the suggestion that Franklin might have been a grave robber, or an accomplice to Dr Hewson, Hilaire Dubourcq, of the Friends of Benjamin Franklin House, responded: "It is possible that he has an alibi. It seems likely that he actually let Dr Hewson have use of the whole house for his school for a time, and went up the street to live with Mary Stevenson. He did not necessarily know what was happening below stairs in the house during his absence." Dr Hewson fell victim to his own researches at an early age. He accidentally cut himself while dissecting a putrid body, contracted septicemia and died in 1774, aged 34. Franklin, who wrote the opening words to the Declaration of Independence, continued to support the widowed Polly, and when he returned to Philadelphia he invited her there to live as his neighbour. Both her sons became eminent medical men, as have successive generations of Hewsons in America. If the first Dr Hewson did obtain bodies for his experiments and demonstrations by robbing local graveyards, he risked the death penalty or deportation. He might have had the help of his students in secretly burying the remains beneath the four-storey house, where the dissections may have been performed. It is hoped to reopen the house to the public at the end of the year. Regular visitors during Franklin's residency included Pitt the Elder (the Earl of Chatham), Edmund Burke, James Boswell, Adam Smith and Thomas Paine, the author of The Rights of Man. During the conservation of 36 Craven Street, excavation of the basement uncovered over 1,200 pieces of human and animal bones in what would once have been the House’s garden. Glass slides, ceramics, mercury and other material found, as well as the marks of saws and other instruments, suggest that these were the remains of William Hewson’s anatomy school, run from the house between 1772 and Hewson’s death of septicaemia in 1774. For the first time since their discovery ten years ago, a variety of the larger bone fragments, including skull and limb bones showing instrument marks, will be on display at Benjamin Franklin House, along with contextual information and images on Hewson’s life and contributions to anatomy and surgery. The human remains derive from over 15 people and show dissection marks from surgical instruments (animal remains were found primarily in the front of the House in the old coal depositories). For example, a femur bone has been cut cleanly probably demonstrating the process of amputation. This was a valuable skill when there was little knowledge of sterilization and much diplomacy took place on the battle field! The skull pieces have circles drilled out from a trepanning device – a sample of one is on display in the Seminar Room. Trepanning was primarily used to relieve pressure on the brain. However, relatively few surgical operations had any likelihood of success; invasive procedures were made difficult by the possibility of major blood loss and infection, and the lack of anesthetic, not used until 1846. Key evidence linking the Craven Street bones to Hewson’s anatomy school is a portion of a turtle spine and mercury found in the bone pit. In an experiment conducted in 1770 at the Royal Society, Hewson showed the flow of mercury through a turtle to highlight the lymphatic system. With help from Franklin, Hewson was elected to the Royal Society and received their Copley Medal for his work. Other items linked to anatomical study were also found in the bone pit, including microscope slides. In Georgian England, the practice of anatomical study became increasingly popular. Limited hospital teaching left a gap filled by private schools like Hewson’s. They also satisfied growing interest in public health and talks by the experts were financially successful. Despite this, procuring bodies for dissection was not easy. It did not become a fully legal practice until 1832. It is likely that some of Hewson’s cadavers came from the so-called ‘resurrectionists’ – bodysnatchers who shipped their wares along the Thames under cover of night. Human and animal bones and teeth were interspersed with fragments of pottery, glassware, metalwork and even free-flowing globules of mercury. Amongst the zoological remains there was material from cats, dogs, fish and even marine turtles. One wonders what Satanic rituals Pinto has in mind that sacrificed fish and turtles? That leaves one point, where Pinto says that from “published photographs” some of the bones “appear to be blackened or charred as if by fire...” It is hard to address this without knowing what photos Pinto has in mind, but I could find no reputable source saying the bones had been burned or charred. I did find that bones can turn black because of manganese (an element critical to bone health, which also happens to cause the black staining one often sees in the toilet! ), so barring better documentation by Pinto or PR, this should be taken as the better option. If the humans were medical cadavers, why were they disposed of like so much trash beneath the house? Why not give them some kind of proper burial? If grave robbers could sneak into a graveyard to steal a body, they could also sneak in to put one back. Furthermore, why were the human remains mingled with those of animals? Pinto is evidently not very bright, as it fails to occur to him that sneaking remains back invokes at least twice the risk of getting caught. That they "could" sneak back is true, as true as it is that a bank robber could return to rob the same bank twice. And not make a bit of sense in doing so. As for the mingling of bones, one may as well ask why medical experiments are done on animals even for human products. The disposal was obviously a convenience regardless of the purpose. Pinto's "uncomfortable questions" merely reflect his own ignorance and wishful thinking. Common knowledge says America’s name came from an Italian explorer named Amerigo Vespucci. PR has a conspiracy theory with what they think is a better explanation which “mainstream academia has yet been willing to accept.” I can’t imagine why not! Their source for this claim is already a red flag the size of Rhode Island; namely, a non-serious historian named Manly P. Hall, a Freemason. A number of difficulties attend this thesis, not the least being one that escapes PR even as they have it in their own book: “America” is first listed as such on a map in 1507 by a German cartographer, while Hall traces the origins of “Amaruca” to the activities of Spanish priests in the early 1700s. It never occurs to PR’s authors to ask about the missing 200 years and where the German cartographer got the name. There are a few other problems as well. “Amaru” associated with South American history is the name of an Inca monarch who lived in the mid-1500s (link below). Listings of Inca deities from various sources are conspicuously void of any “Amaru,” although there was apparently a tribe by that name, and the word did mean “serpent.” At best, it seems Hall confused an abstract term for a proper name. No definitive conclusions can be reached. Too many claims are, for lack of hard evidence, based on speculation. Theories about the true origin of the name are ultimately historical fictions. Yet behind these fictions lie compelling views of the New World. Taken together, they form a multicultural vision of its distinctive character. To hear Americus in the name; to hear the Amerrique Mountains and their perpetual wind; to hear the African in the Mayan iq' amaq'el; to hear the Scandinavian Ommerike, as well as Amteric, and the Algonquin Em-erika; to hear Saint Emeric of Hungary; to hear Amalrich, the Gothic lord of the work ethic, and the English official, Amerike — to hear such echoes in the name of our hemisphere is to hear the wishful projections of their proponents, as well as ourselves. That is probably the best way to describe how PR manages to see “Amaru” involved. From this you’d think they caught Jimmy Carter performing an Aztec sacrifice with Ronald Reagan’s bloody heart in his hand, but what they discuss isn’t anything near that. And though it is done at night when it is dark, it is hardly a secret, much less an occult ritual. Basically, there’s this sort of resort called the Bohemian Grove which is kind of like a California version of Camp David, where people with big names, especially political people, go to relax. At this camp, they have a sort of ceremony called the “Cremation of Care” where an effigy called “Dull Care” is cremated beneath a huge statue of an owl (the camp’s mascot). Horn says that this is “for the purpose of magically alleviating the cares and concerns of the elitists making the sacrifice,” but news flash – this is no more “magical” than one of those goofy seminar tricks where you put on an Abe Lincoln hat and a sign that says HONESTY. What makes Horn all kooky about this one is that he has bought lock, stock, and lunacy into this notion held by equally-loony radio host Alex Jones, that this was some sort of re-enactment of a Caananite ritual. Not that Jones is any kind of expert on ancient Canaanite rituals, but I imagine one could find a resemblance as long as you squinted real hard, stood on one leg, and put Acharya S on your research panel. Nor is this event any dark secret. Horn claims that Americans were “not aware” of this ritual until Jones snuck into the Grove and filmed it, but you can plainly find it referenced in 1975 book, The Bohemian Grove and Other Retreats: a Study in Ruling-class Cohesiveness. There is even a 1918 book, The Grove Plays of the Bohemian Club, produced by the club itself, which tells of the origins of the ceremony – in 1880. You can also find it described in the 2008 book Conspiracy Theories and Secret Societies for Dummies. I’ll resist the urge to say that’s a highly recommended book for Horn and his followers. So while this Cremation of Care ceremony is pretty goofy-- it strikes me as the sort of thing some extroverts do to get in the mood for whatever it is they like to do -- it’s no goofier than the Fred Flintstone putting a buffalo skin on his head, or, as noted, what might go on at a seminar these days. It’s not sorcery, and it isn’t a sacrificial ritual. It’s just goofy. You know...kind of like Tom Horn. Yes, Norman Geisler is at it again; all it takes to set him off repeating the same old stuff these days is a yak sneezing in Alberta. The latest incarnation, though, is more about Craig Blomberg than Mike Licona, and as usual we’ll just pick out what’s new – which isn’t much. For Dunn, Jesus had in mind that "His death would introduce the final climactic period, to be followed shortly ('after three days'?) by the general resurrection, the implementation of the new covenant, and the coming of the kingdom.” Here Dunn’s imposition of Jewish eschatology genre effectively eviscerates any idea of Jesus’ physical, literal resurrection on the Sunday after His crucifixion and places it entirely into distant future of Jewish expectations of a final resurrection at the Last Judgment. It does? Well, no, it doesn’t. What Dunn is saying – wrongly, but that is beside the point here – is that he thinks Jesus’ Resurrection was seen by Jesus as being a signifier of the general resurrection. Nothing Dunn says in this quoted sentence in any way releases a judgment about the Resurrection of Jesus as physical or not, literal or not (and though Dunn may or may not say something else that does that, I have no recollection of him doing so in his many works I have read). If anything, it favors a physical and literal reading of it, but Geisler errs profoundly in that he is inserting his dispensational eschatology into Dunn’s words. Dunn is not referring to a “distant future” but a general resurrection three days, or “shortly,” thereafter. Let me emphasize again that I do consider Dunn wrong in his reading here. However, this is not made any better by Geisler abusing it to enact his own exegetical fantasies. After another quick bash at Licona, Geisler gets on Blomberg’s case for the rest of the article. We can skip a lot of this; there’s some typical amusement (e.g., both Geisler and Mohler are unworthily called “scholars”!) and typical panic button pushing (“opening up a proverbial avenue for major portions of the Gospels to be labeled as non-historical in genre”) to start, before we get to hear the ambulance siren. It’s again little atypical though; Blomberg’s views represent a “significant, substantive shift” from Geisler’s head-in-sand exegetical approach to one that tries to understand the Bible as it was written by those who wrote it, though of course, it is not put quite that way. Let's take the prime example. I've answered points claiming contradiction between Matt and Luke's versions of the Sermon on the Mount by noting that Matt's version is likely to be an anthology -- a collection of Jesus' teachings, organized by Matthew according to his purpose as the composer of a handbook of faith; whereas Luke is more on the historical side, and reports what was actually said on that occasion. No big problem. Both writers were following standard literary and historical practices for the time. But Thomas insists that such an approach "inevitably leads to diminishing historical accuracy in the Gospels" -- for you see, Matthew 5:1-2 "indicates Jesus began at a certain point to give the Sermon's contents." And what of the literary-device explanation above? Thomas wonders, then, "why would (Matthew) mislead his readers" into thinking that Jesus made this full sermon on one occasion? What is missing here: This was a normal practice for the day. No one would be "misled" into thinking this was a full sermon because no one would have thought it was meant to be recorded as such in the first place. But Thomas, clearly, does not agree, with comments like this in response to Blomberg's assertion that Biblical writers followed the typical practices for composers of the day: "Despite what the practice of ancient historians may have been, Matthew's intention to cite a continuous discourse from a single occasion is conspicuous. Was he mistaken?" "No matter what the alleged motives of the writers in so doing, that kind of action is fundamentally problematic at best and dishonest at worst." (!) The only difference between these comment and comments like C. Dennis McKinsey's "read the Bible like a newspaper" is that McKinsey is nastier in his formulations. And yet we are told that it is we who propose such solutions who are "run(ning) roughshod over the historicity of the Sermon's introductory and concluding formulas". You might wonder, of course, how Thomas suggests that we resolve the differences in the Sermon, and his answer is: By harmonization -- of an extreme, unnecessary sort. Put it this way: Did Jesus say, "Blessed are the poor" or "Blessed are the poor in spirit"? Thomas replies: He said both, and on the same occasion. Matt and Luke just chose to report one or the other: "Most probably Jesus repeated this beatitude in at least two different forms when he preached His Sermon on the Mount/Plain, using the third person once and the second person another time and referring to the Kingdom of God by different titles." Odd here how omission is not a sin; but commission is. I thought it was Matthew's intent to show he was citing a continuous discourse? If that is the case, isn't he "misleading" his readers by not giving a full report and leaving things out? There follows from Geisler and extended rant (it may as well be called that) on how George Eldon Ladd tried to please both sides, so to speak, and failed. I am sure many view Geisler’s adherence to old earth views the same way. Then we get to an extended second rant on how Blomberg defended Robert Gundry, and Geisler repeats all the usual buzzwords, including the misuse of stats from the vote which expelled Gundry from ETS. Yet, how could one ever known the motive of such ghost writers? Would not such a false writer go against all moral standards of Christianity? Here Geisler steps into a pile of non sequitur of his own creation: He has rapidly moved from uncertainty (“How could we know?”) to certainty (“We know this would be immoral!”). He has also merely raised the spectre of panic without justification. I do not agree with the whole of Blomberg’s thesis here, but I imagine he would answer that the benign motives of the writers are proven by 1) the contents of the writings in question, which obviously do not serve any self-seeking purpose for the author; 2) the fact that the church at large evaluated and accepted these writings. Either way, inciting unreasoning panic isn’t an argument. Interestingly, recently, Craig Blomberg blames books like Harold Lindsell's Battle For the Bible (1976) and such a book as The Jesus Crisis for people leaving the faith because of their strong stance on inerrancy as a presupposition. And he does so rightly. I have encountered numerous apostates over the years who left the faith, or dealt with many Christians in a faith crisis, because of exegetical midden like Lindsell’s, and The Jesus Crisis, provided answers that were utterly impossible to defend of justify. Of course, Geisler himself sits on a throne well above all of this; he never answers emails from people hurt by his stance, or gets down in the trenches with the likes of a Dennis McKinsey. Well, scratch that: He did debate Farrell Till, and did so by reading prepared statements the whole way through. That sure does the job, doesn’t it? In doing this, evangelicals of this approach, subject the Scripture to forms of historical criticism that will always place the Bible on the defensive in that it can never be shown to reflect historical trustworthiness. Indeed, logically, probability for one person may not be probability for another. What is accomplished is that the Gospels are placed on shifting sands that never have any foundational certainty for “certainty” cannot be entertained by their methods. Indeed? Let me put it this way: If Geisler thinks this, it is only because the sort of work being done by scholars (term deserved) like Licona, Blomberg, and Bock is atmospherically beyond his comprehension. The sands do not “shift” – Geisler is wearing greasy sneakers. Is this the same Geisler who is even now arguing a point? Why is he bothering if “what is probable to one may be improbable to another”? Isn’t he worried that his critics will not “accept his logic”? Doesn’t he care that many would think he has imposed his own presuppositions and is “VERY FAR” from being evenhanded? Consistency sure demands a lot of us, doesn’t it? Book Snap: Paul Verhoven's "Jesus of Nazareth"
Book Snap: Borg and Crossan's "The First Paul"
Reads for Fun: Daniel Butler's "The Lusitania"